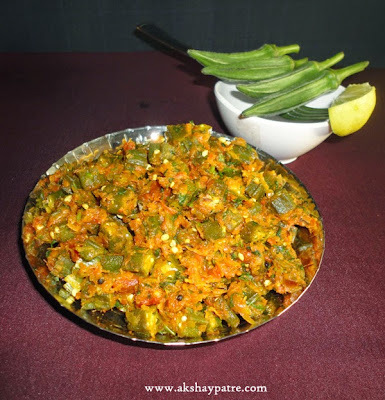 Kadai bhindi recipe - I am never ever bored with bhindi ( Ladies finger / okra ) side dishes. Be it Bhindi Masala, Stuffed Bhindi or Bhindi Upkari. Every week we have bhindi side dishes either for lunch or dinner. One such dish is kadai bhindi which is a nice accompaniment for Indian flat breads. 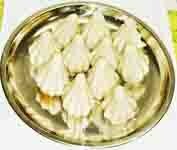 Its a nice side dish for rice and curry too. Mixing this kadai bhindi with rice and dal also gives an excellent taste to the meal. Wash and chop the tomato, onion, ladies fingers and coriander leaves. Keep them aside. Heat the oil in a pan, add the grated onion and fry till the onion turns light brown. Add the tomato and saute for 2 - 3 minutes. Add the coriander powder, jeera powder, chilly powder, turmeric powder, garam masala and stir to combine. Add roundly chopped bhindi, salt and stir to combine. Cook covered on low flame till the bhindi turn soft. Remove from the flame, add the chopped fresh corianders, mix well. Serve the kadai bhindi hot as aside dish. 1. 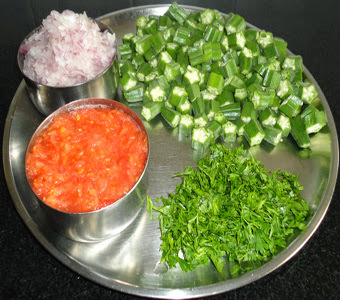 Wash and chop the tomato, onion, ladies fingers and coriander leaves. Keep them aside. 2. Heat the oil in a pan, add the grated onion and fry till the onion turns light brown. 3. Add the tomato and saute for 2 - 3 minutes. Add the coriander powder, jeera powder, chilly powder, turmeric powder, garam masala and stir to combine. 5. Remove from the flame, add the chopped fresh corianders, mix well. 6. Serve the kadai bhindi hot as aside dish. My family always love this bhindi. Yummy and delicious!